Optional to add other spring veggies to the dish. Cook the pasta accoring to instructions and drain. Keep warm. Meanwhile remove sausage meat from the casings. Cook about 6 minutes or until the meat is no longer pink. Add tomatoes to the meat mixture, turn heat to high and bring to a boil, add peppers. 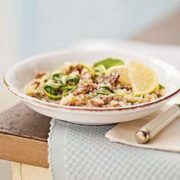 Stir in drained, cooked pasta, mint & basil. 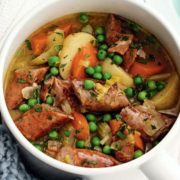 This lighter spring version of sausage stew only requires one-pot so there is less washing up to do at the end. Perfect! Step 1: Heat oil in a large, heavy-based saucepan over medium-high heat. Cook sausages, turning, for 10 minutes or until just cooked through. Transfer to a plate lined with paper towel. Step 2: Add bacon and fennel seeds to pan. Cook for 5 minutes or until lightly browned. Add onion, leek and garlic. Cook for 5 minutes or until leek has softened. Stir in flour. Add carrot, celery and potato. Cook, stirring for 1 minute. Add stock, stirring until smooth and combined. Bring to the boil. Step 3: Reduce heat to low. Simmer, partially covered, for 20 minutes or until potatoes are almost tender. Cut sausages into .25″ thick slices. Return to pan. Cook for 10 minutes or until sausages are heated through and potatoes are tender. Stir in peas. Cook for a further 5 minutes or until peas are bright green and tender. Add the broccolini during the last 2 minutes of cooking. Reserve 1 cup cooking water, then drain the pasta and broccolini. Heat 1 tablespoon olive oil in a large skillet over medium-high heat. Add the meatballs and cook, turning occasionally, until browned and cooked through, 5 to 6 minutes. Drain on paper towels. Pour off any drippings from the skillet. Add the remaining 3 tablespoons olive oil, the garlic, red pepper flakes and 1/2 teaspoon salt. Cook over medium heat, stirring, 1 minute. 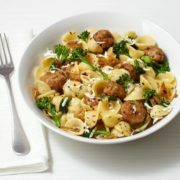 Add the pasta, broccolini and meatballs. Whisk the egg with the reserved cooking water in a small bowl, then add to the skillet and stir until the sauce thickens slightly. Sprinkle with the cheese and drizzle with olive oil. Cook greens in boiling salted water just until wilted, about 1 minute. Drain; cool. Melt 1 tablespoon butter in large saucepan over medium heat; add onion and garlic. Sauté until onion is translucent, about 5 minutes. Add sausage; sauté until brown, breaking up with spoon, about 3 minutes. Add rice; stir 1 minute. Add wine; reduce heat to medium-low. Simmer until wine is almost absorbed. Add 1 cup broth. Stir until broth is almost absorbed. Add remaining 4 cups broth by 1/2 cupfuls, allowing broth to be absorbed before adding more. Mix in greens after 10 minutes. Cook until rice is tender and mixture is creamy, 25 minutes total. Mix in cheese and remaining 3 tablespoons butter. Serve risotto, passing additional cheese. Meanwhile, heat the olive oil in a large skillet over medium heat. Add the sausage until it is no longer pink, then add garlic and cook until just golden, about 30 seconds. Add the tomatoes, red pepper flakes and 1 teaspoon salt; cook until the tomatoes begin to wilt, about 2 minutes. Stir in 1/4 cup of the reserved cooking water. 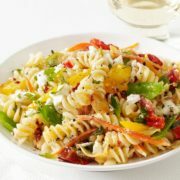 Pour the tomato mixture over the pasta and vegetables. Add parmesan, half the goat cheese and mint or parsley and toss to combine. Season with salt. Welcome Spring! This one-pan meal is a true weeknight wonder. Voila! Wash 5-7 small red potatoes. You don’t have to peel them. Cut the potatoes into about 1 inch chunks. Any roasting potato will do as long as you cut them into roughly the same size chunks.After you chop each ingredient put them all into a large plastic bag as you go. This saves on having to wash a bowl! This time, instead of garlic powder, why not try some fresh crushed garlic. Remove the stem and seeds from 1 red pepper and cut it into bite size. Peel 3 medium carrots and cut into one inch chunks. Peel and cut 1 medium onion in half, then in quarters, then in 1/8’s. Pour 4 tablespoons of olive oil over the whole thing and mix it all together inside the bag. Don’t forget to add a sprinkle of salt, pepper and some dried rosemary. Gently squish everything together in the bag. Empty the bag out on to a baking sheet with sides. Now for the sausage! Remove the casing from 1 pound of sausage and cut into 1 inch chunks. I like to use many different types of sausages. 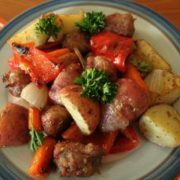 Turkey sausage, hot or sweet sausage, Piemonte Sausages, they all taste great in this recipe. Just choose your favorite. Put the dinner in the preheated oven. Stick it back in the oven for another 15-20 minutes or until everything is crispy and roasted. By now your kitchen has a wonderful aroma permeating through it and all of your neighbors will be wishing they were invited to dinner! 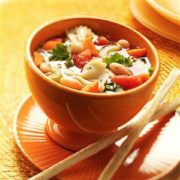 1 cup: 164 calories, 3g fat (0 saturated fat), 0 cholesterol, 426mg sodium, 26g carbohydrate (6g sugars, 5g fiber), 6g protein. Diabetic Exchanges: 1-1/2 starch, 1 vegetable, 1/2 fat. TOTAL TIME: Prep: 15 min. Cook: 25 min. In a Dutch oven, saute the sausage until it is no longer pink, drain. Then saute the celery, onion and carrot in oil until tender. 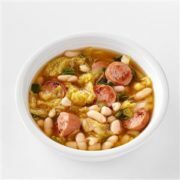 Stir in the water, beans, tomatoes, broth, wine and seasonings. Bring to a boil. Stir in pasta. Reduce heat; simmer, uncovered, for 13-15 minutes or until pasta is tender, adding escarole during last 3 minutes of cooking. In a Dutch oven, cook sausage over medium heat until no longer pink; drain. Stir in the remaining ingredients. Bring to a boil. Reduce heat; simmer, uncovered, for 16-20 minutes or until flavors are blended. Yield: 6 servings (2 quarts). 1-1/3 cups: 416 calories, 21g fat (8g saturated fat), 53mg cholesterol, 1411mg sodium, 35g carbohydrate (9g sugars, 12g fiber), 23g protein. In a large saucepan, cook and stir sausage over medium heat until lightly browned; drain. Add the remaining ingredients; bring to a boil. 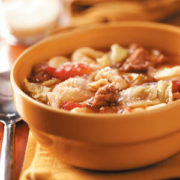 Reduce heat; simmer for 5-10 minutes or until cabbage is tender and flavors are blended. 1-1/3 cups: 283 calories, 14g fat (5g saturated fat), 35mg cholesterol, 1672mg sodium, 24g carbohydrate (3g sugars, 6g fiber), 15g protein. TOTAL TIME: Prep: 15 min. Cook: 30 min. In a large saucepan, cook sausage over medium heat until no longer pink; drain. 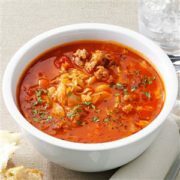 Stir in the water, cabbage, tomatoes, broth and soup. Bring to a boil. Reduce heat; simmer, uncovered, for 8 minutes. 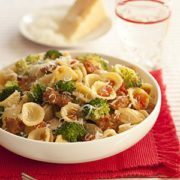 Stir in tortellini; cook 7-9 minutes longer or until pasta is tender. Sprinkle with cheese. Freeze option: Before adding cheese, freeze cooled soup in freezer containers. To use, partially thaw in refrigerator overnight. Heat through in a saucepan, stirring occasionally and adding a little broth, water or milk if necessary. Serve with cheese. (2-1/2 quarts). 1 cup: 199 calories, 10g fat (4g saturated fat), 34mg cholesterol, 912mg sodium, 17g carbohydrate (5g sugars, 2g fiber), 11g protein.